The longest government shutdown in history came to a close last Friday as President Trump agreed to sign a temporary spending bill while border wall negotiations continue. 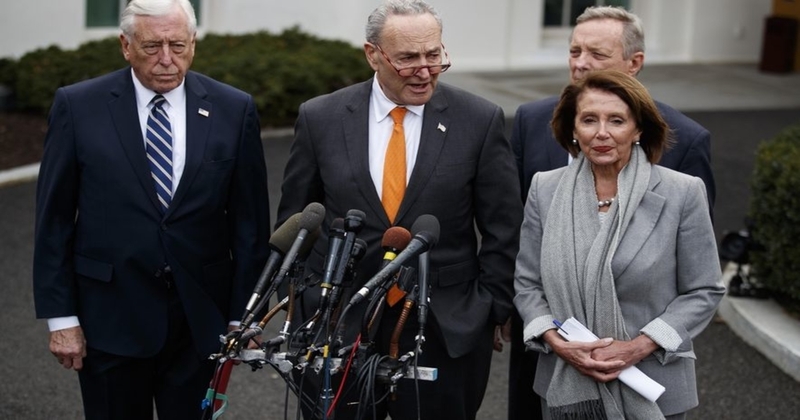 Some say that Trump lost the fight by caving to House Speaker Nancy Pelosi who would not agree to allot $5.7 billion for a wall at the southern border, while others say that Democrats have revealed themselves to be obstructionists for purely political purposes. Curious about how AllSides has rated the media bias of hundreds of outlets? This short video explains how we do it. Check out some other big stories this week: Kamala Harris Sparks Debate Over Medicare for All, U.S. and Taliban Agree to Draft Peace Deal, and Republicans Poised To Rebuke Trump On National Security Moves. "Mr. Trump has floated another idea to get his wall funding, declaring a national emergency and order the wall to be built. The president has the legal authority to do so, though this option makes a lot of us uneasy. Declaring a national emergency in the face of political intransigence would set a dangerous precedent. The Democrats, by refusing to protect the country’s sovereignty for nakedly political ends, are setting a dangerous precedent themselves." Who’s at Fault in the Shutdown Fight? "At the very least, the congressional GOP deserves a larger portion of the blame, and its insistence that this is only a crisis now that it is not in charge should be added to the hypocrisy list alongside the Democrats’ sudden moral horror of walls." "If the liberal media cared a whit about border security and fairness in reporting, and despised Trump just a molecule less than they do, they wouldn’t be gloating about Pelosi’s superior negotiating skills, but would excoriate Democrats for being on a singular mission to destroy Trump – no matter the cost to America and Americans." "What a debacle President Trump’s shutdown proved to be — what a toddler’s pageant of foot-stomping and incompetence, of vainglory and self-defeat. Mr. Trump tormented public servants and citizens and wounded the country, and, in conceding on Friday after holding the government hostage for 35 days, could claim to have achieved nothing." "If Mr. Trump continues to insist on funding for a piece of wall, which he says is a matter of “no choice,” he should offer serious concessions on immigration to the Democrats — not the phony package peppered with poison pills that he rolled out a week ago, but a secure future for two groups whose protections from deportation he has tried to rescind: “dreamers” brought to this country as children by their parents, and migrants who have been living legally in the United States on temporary protected status, having fled unrest and natural disasters at home." "Given the political hit Trump took on the recently concluded shutdown -- both in terms of his poll numbers and from elected officials within the GOP -- it's very hard for me to see him triggering a second shutdown in the middle of next week. Which would leave him with only one option: Say that the border represents a national emergency, a declaration that would allow Trump to take from money previously allocated to other departments and use it to fund his border wall." "Following the votes in Congress, Mr Trump tweeted that his decision had been 'in no way a concession', but was 'taking care of the millions of people who were getting badly hurt by the shutdown'." "U.S. President Donald Trump and congressional Democrats on Thursday hardened their positions over a wall being built on the border with Mexico, raising new doubts over their ability to reach a deal just as negotiations were getting underway." "President Trump said Thursday that the White House and congressional negotiators were no closer to an immigration deal, five days after he agreed to end the partial government shutdown, and reiterated he is willing to act alone to build a wall on the southern border."